In addition, all 2019 Pathfinder models continue to offer standard Automatic Emergency Braking (AEB) and Nissan’s innovative Rear Door Alert2 (RDA) system, which can help remind customers of items that may be forgotten in the rear seat. All 2019 Pathfinder models are equipped with a 284-horsepower 3.5-liter V6 with Direct Injection Gasoline™ (DIG) system and Xtronic transmission. Torque is rated at 259 lb-ft. Standard maximum towing capacity is a best-in-class3 of up to 6,000 pounds (when properly equipped), giving owners the ability to tow two-axle recreational trailers, whether for watercraft, flatbeds or campers. 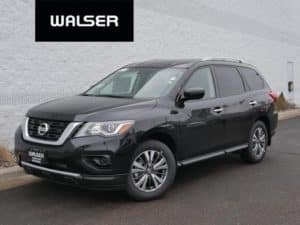 Pathfinder’s stylish, adventure-ready interior includes comfortable seating for seven and features Nissan’s innovative EZ Flex Seating System™ with LATCH AND GLIDE™, a 2nd row tilt and glide seat that allows easy 3rd row access with a child safety seat still installed. The 2019 Pathfinder also offers available Intelligent Around View® Monitor (I-AVM), Bose® 13-speaker premium audio system, Dual Panorama Moonroof, Motion-Activated liftgate with liftgate position memory and NissanConnect® with Navigation and Services. 1. MSRP excludes applicable tax, title, license fees and destination charges. Dealer sets actual price. Prices and specs are subject to change without notice. Destination and handling $1,045. 2. Rear Door Alert is intended to remind people to check the back seats of their vehicle under certain circumstances. It cannot prevent accidents caused by inattention or carelessness. 3. Ward’s Segmentation. MY19 Pathfinder AWD Pathfinder vs. in-market 2018 & 2019 Large Cross/Utility Vehicle class competitors. Towing capability varies by configuration. See Nissan Towing Guide and Owner’s Manual for additional information. Based on manufacturers’ websites.